You only have to look back through this blog to realise that I have a great love for Rube Goldberg machines. There is something so alluring about the vested time vs the outcome. In a world where we want everything now but we don’t want to put much effort into getting it the Rube Goldberg machine is the antithesis of this. I admire anybody that not only has the imagination to dream up such machines but also embraces the absurdity and invest time and money into the craft of realising their creations. If you’re like me revel in the absurdity then check out the video below which I found on the NYTimes website. Joseph Herscher’s love for Rube Goldberg machines has lead him to working within the community and is getting him some well deserved interest. Recently I attended a 3 day training session on building home-brew CNC machines which was run by Dave Turtle from the RCA. It was an amazing 3 days and I will post the photos and videos of the results as soon as possible. One of the hurdles that came crashing in on day two was the limitation of running the kit from the parallel port. There really aren’t that many computers these days that still roll out with a parallel port as standard, not to mention my nice shiny mac does not come equipped with a parallel port. I was 100% sure the solution to this problem was the trusty Arduino. There have been many projects where the Arduino has already been used as the heart of a CNC machine, the first that comes to mind is the REPRAP. There is also another CNC project called Contraptor which utilises the Arduino at its heart. The home site for the Contraptor project has a lot of useful information, it was there I came across Grbl. I tried the RepRap g code interpreter, fiveD but I could not get it to compile for the Arduino (Any tips would be gratefully recieved). I also tried a few other interpreters with varying success: teapot, rsteppercontrol and arduino-gcode-interpreter-new. I really struggled, probably partly due to my lack of understanding when it comes to g-code. I had no success over the three days of training but I did find Grbl though I didn’t have the kit to test it. Grbl seemed like a very simple solution but the main hurdle when it comes to implementing it is that you need to use avrdude to flash it to the Arduino you can’t just send it via usb direct to the Arduino. I have never done this before so I let the Arduino rest for the the remainder of the training with a mind to try it as soon as possible. Today I started messing around with Flashing Grbl to the Arduino and was caught out by several issues which slowed my progress. There are already several sites with information on how to do this but I found I needed bits from all my sources to get the job done. I thought I would document my process in case anyone else finds it useful. The Arduino that is going to act as a programmer needs to have the programming firmware uploaded to it. This is a very simple task as it is all built into the Arduino IDE. Open up the Arduino IDE then go to File -> examples -> Arduino ISP then upload the sketch to the Arduino. The Arduino is now fully setup to Flash another Arduino. 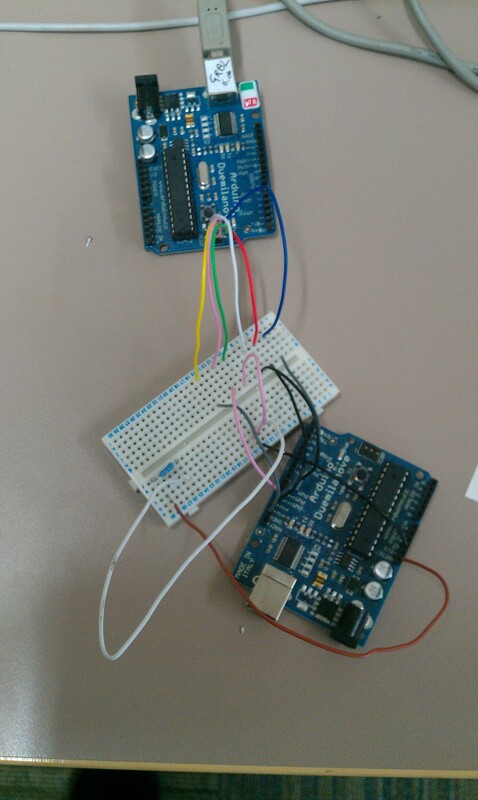 The next step was to wire one Arduino to another to use as a programmer. I found the wiring diagram from Sparkfun here and the picture below is my version of the wiring. One thing that sparkfun didn’t explain is that you must disable auto reset on serial connection. I found out how to do this here. I could not find a cable to suit so unfortunately I had to solder directly to the ISCP headers (not pretty). Now all the setup is done it is time to put AVRDUDE to work, on a Mac this is done via terminal. I found the terminal commands for AVRDUDE on sparkfun here about half way down the page. Hopefully thats it, Grbl is now installed! If you want to test that Grbl is working properly the you can download CoolTerm which is a GUI for mac for sending and receiving information on serial ports. In my opinion Andrew Smith has cracked it. As a child I spent hours creating and inventing with Lego, Mechano or just good old fashioned wood and nails. I find myself wishing that I could have carried on doing this forever; that I could make a living from play. Andrew’s recycled, kinetic art echos a mad-max-esque visual aesthetic and speaks volumes in terms of a “throw away society.” I especially like his observation in to the way in which value of an object is defined by how much somebody else wants that object. Check out Andrews work on his site. I am a massive fan of elaborate, over the top, complex mechanisms that achieve small tasks. I love everything from the countless examples of Rube Goldberg machines out there to the imaginative and humorous scribblings of Heath Robinson. This mechanism designed by Rob Higgs is a beautifully elaborate autonomous bottle opener/pouring device. I find it quite hard to imagine how you would begin to build an object like this. There are three main reasons why i love this project. Firstly the switches are ingenious. They look to be made out of washers cut in half and separated then as the ball bearing is placed down it connects the two half’s and joins the circuit together. Its so simple that is brilliant. The second reason i like this project so much is that it uses the old CRT type screen. If you ever go to a dump you will see plenty of these thrown to waste replaced by the more convenient TFT monitor. Its nice to see the old monitors being put to use, i have always thought that the CRT screen would make an awesome base to a coffee table (project coming soon). I also love that the interface is placed directly above the screen making it possible for the interface to react and change colour throughout the experience. I found this project on the MAKE magazine blog. The Make blog has more information on the build and techniques used for communicating with the computer so if this interests you take a look there as well.